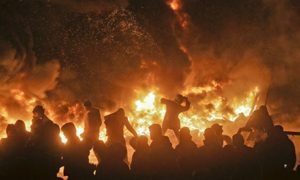 WASHINGTON — The European Union now imposed sanctions on the Ukrainian government led by President Viktor Yanukovich, after a truce was broken between European Union-leaning protesters and the Ukrainian police. The protests were a direct response to Yanukovich’s decision to pull out of a trade pact with the European Union last year, after which the U.S. and E.U. criticized Russia for interfering in Ukrainian affairs. Russia blasted the U.S. and E.U. for meddling in Ukraine’s politics for supporting the protesters. Yanukovich had even called in sick during the peak of the protests last month, especially after his supporters in the Ukrainian parliament passed a ban on protests. However, American deputy secretary of state Victoria Nuland received flak for her critical comments toward the Ukrainian opposition leaders and the E.U.’s own role during the political standoff. Her comments, a recorded telephone conversation, angered the E.U. when she said, “F— the E.U.” to the U.S. ambassador to Ukraine. U.S. President Barack Obama was nowhere to be seen when the police cracked down on protesters camping out in Independence Square in the capital city of Kiev (also spelled Kyiv). Vice President Joe Biden warned Yanukovich of the brutal police retaliation. Obama addressed the press and the public the following day and condemned the police response.